The thing about unfitted dresses (like the ones below) is that they need to be short or they can verge on looking frumpy. 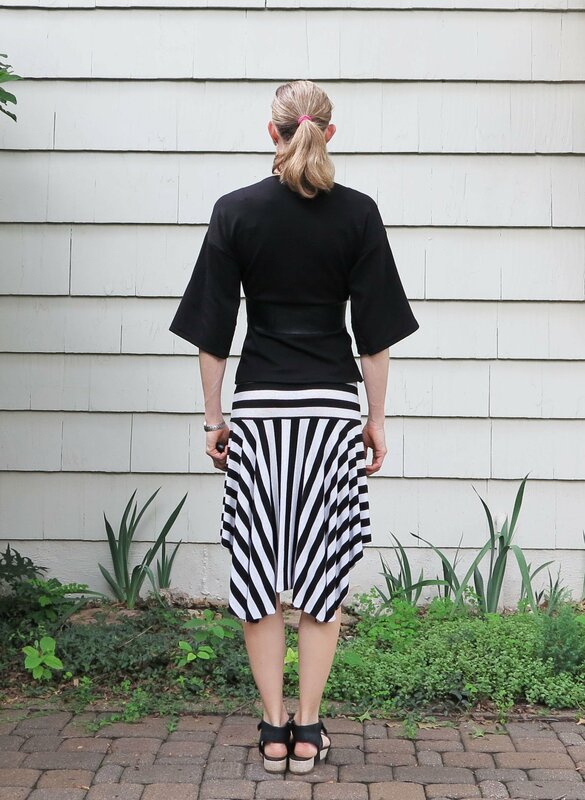 In my opinion, the black tunic dress that I used for this refashion went slightly over the length threshold. It’s only a very small difference, but it has a big impact. Compare the difference in look with these two very similar dresses. There were a few other things about the black dress that I didn’t like. The base ponte fabric, whilst interfaced, didn’t have the structure to give this style a nice shape. It drapes too much. I should have either made it fitting (as would suit a ponte knit) or choose a more structured, woven fabric and flared it out. Like the length, the fit is half-way there but neither fitted or boxy. The sleeves and front zipper don’t do this dress any favours either, but I remember why I made it as I did. I was using up a limited scrap supply at the time which meant I couldn’t cut the fabric as one piece and proper sleeves weren’t an option. I love problem solving ways to make things work and I definitely enjoyed the process of making this jacket. However, don’t be fooled into thinking that anything about it is couture. I just bound and topstitched the leather and I have yet to hammer those seams flat. The waist tie is an unfinished strip of leather. I really wasn’t sure that this would work out at all. It still leaves a lot to be desired, but it is much better than I anticipated, and a good reference point for drafting a similar piece in the future (and one that might closer resemble my inspiration). The steps in this refashion were pretty simple. I started with my tunic and cut off the hem to the length of jacket I wanted. I preserved that hem (including the back embellishment) by dividing it in half and turning those halves into the sleeves. I then just unpicked the bound neckline to change the shape of it a little, attached the front leather panels, and bound or turned the raw edges under. I can see myself getting a lot of wear out of this in Autumn, but most likely with jeans. I seem to be without jeans at the moment or I would have worn them in the photos. Jeans are one of my few RTW concessions. I just can’t summon the desire to make myself a pair, despite admiring the amazing handiwork of others out there. This entry was posted in Uncategorized and tagged faux leather, Jaywalk, jersey, leather, ponte, refashioning, Tessuti Fabrics on July 11, 2015 by Debbie Iles. i’m so with you on the jeans–mainly because i know i’ll want ALL THE PROPER SUPPLIES. this is the most stunning refashion i’ve ever seen. HOLY COW WOMAN. you knocked this out of the universe! Great job with the refashioning. Truly is a nice garment and fit is perfect. Gorgeous!!!! I loved the original dress, but holy cow if this doesn’t give it a stunning re-boot!! Awesome job! Great refashion. You will get a ton of wear out if this lovely jacket. I love your skirt. Did you make that as well? Thank you! Yes, I made the skirt as a maxi about a year ago, but recently modified it to the shorter length. Now I wear it almost everyday. So comfy!